Neither Europe nor Asia, Azerbaijan is a tangle of contrasts. Surrounded by semi-desert, the cosmopolitan capital, Baku, rings its Unesco-listed ancient core with mushrooming new skyscrapers. The country has trade relations with 84 countries around the world. Its economy is heavily dependent on crude oil exports, with oil alone generating about 47 per cent of GDP. However the government of Azerbaijan is also planning to diversify its economy by stimulating other industries. As it has been recently reported, the country has the huge potential to rival Dubai and Singapore as an international trade and logistics hub. The energy-rich nation has been already investing in infrastructure to become an important point along trade routes between Europe and East Asia. Azerbaijan's exporters sell oil products, cotton, tobacco, wine, refrigerators and chemical products to the overseas markets. The country imports food stuff, automobile and industrial equipment, metal and wood materials, clothing, shoes and domestic appliances. In the future Azerbaijan makes plans to export ready industrial items instead of raw materials. 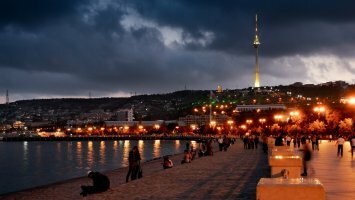 Looking to export to Azerbaijan? Would you like to develop your business in Asia or Caucasus Region? Export Portal connects your business to the world and helps importers and exporters engage more effectively in the global market. Discover thousands of new products from quality Azerbaijan's exports, manufacturers, wholesalers and suppliers. Exporting opens up a world of opportunities for your business. Azerbaijan is a surprising and beautiful country having a unique nature, culture, history, food, customs and tradition. It is often called "the country of fires" (from "azer" – which means fire). Location of Azerbaijan in intersection of Europe and Asia creates perfect conditions for the main part of the international trade turnover with the nations of this continent. Buyers around the world always looking for well-known Quban carpets from Azerbaijan, authentic wines, gold ware, high-quality silk and many other products. If we take the country's structure of imports, only twelve percent of food is imported to Azerbaijan from other nations. Consequently Azerbaijan is not particularly dependent on food imports, with the exception of grain. The country is one of the highest consumers of bread in the world. Important exportable commodities in the country also include passenger cars, tobacco products, pharmaceutical products, precious metals and articles, furniture and its parts, converters, sugar and machines. Top import partners of Azerbaijan are Turkey, Russia, Germany, the United Kingdom, the US, and Italy. Export Portal is your top source to find verified sellers from Azerbaijan for a wide range of products and services. Sign up today to contact suppliers and connect with trusted importers and exporters from Azerbaijan. Azerbaijan is a country situated in southwestern Asia, bounded by the Caspian Sea and Caucasus Mountains, which span Asia and Europe. The country is a member state of the Council of Europe, the OSCE and the NATO Partnership for Peace (PfP) program. It is one of the six independent Turkic states, being an active member of the Turkic Council and the TÜRKSOY community. Azerbaijan has diplomatic relations with 158 countries and holds membership in 38 international organizations. It is one of the founding members of GUAM, the Commonwealth of Independent States (CIS) and Organization for the Prohibition of Chemical Weapons. Azerbaijani licensing procedures are not in line with the General Agreement on Tariffs and Trade (GATT) and the Agreement on Import Licensing Procedures. A Presidential Decree issued in 2002 significantly reduced a wide range of licensing requirements and introduced transparency in the licensing procedure. Many licensing requirements remain in place, however in the context of the ongoing World Trade Organization (WTO) accession negotiations new procedural rules for the issue of licenses must be introduced and existing laws appropriately amended. Government licensing is required for the import of tobacco, ethyl spirits and alcohol. ozone depleting materials and goods.